Today saw a SHARE with Schools’s first, as 15 volunteers, 5 PG coordinators and a faculty member worked alongside 120 Fitzalan High School pupils. Fitzalan were running their ever exciting Eisteddfod event–a Welsh cultural festival–so the pupils were out of normal timetable and doing all sorts of exciting extracurricular or enriching activities. 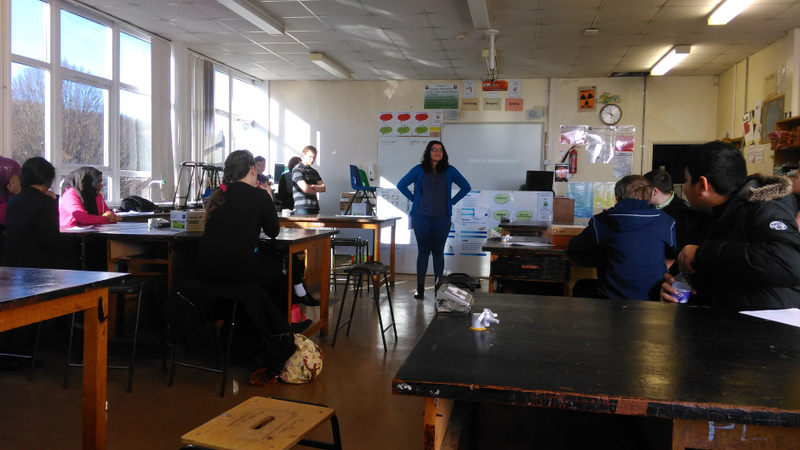 We ran three workshops in parallel, with each being delivered twice to different pupils. The workshops consisted of the brand new Religion in the Media Workshop, the STEM Archaeology Workshop and the Museum Curatorship Workshop. All went fantastically, with some brilliant work being produced by the pupils. They were a pleasure to work with. Excellent resources that engaged the pupils. Pupils were fully engaged for the whole sessions. As librarian I often witness pupils are not able to remain focussed for an hour – but all were well behaved today. The students were introduced to an area which they may never have an opportunity to experience. They were interested and inspired about archaeology. Great team of people very at ease with delivering the contents. Great interactions, communication with comments. Especially the idea of the uni students go[ing] around and meeting/teaching each one of the groups. The resources allow the pupils to visualise what is being discussed, and reach conclusion in their own times. (A lot of the pupils present today were EAL [English as an Additional Language] but they all were able to quickly understand and follow the lesson.